American Outdoor Grills are designed to add distinction to the look and functionality of your outdoor kitchen. The AOG 24’’ PCL Portable Grill is a standalone portable grill that can serve as an addition to your flourishing outdoor kitchen, or it can act as the foundation. It has a stylish and sleek appearance, with a rounded hood and contoured face made of stainless steel with a satin finish. 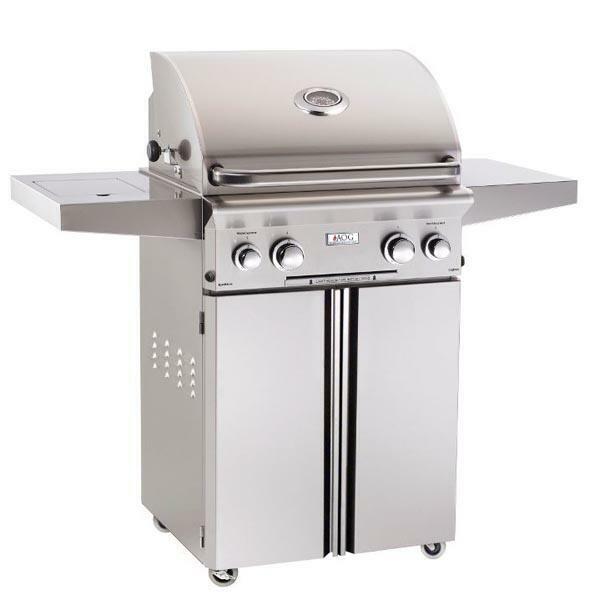 The 24’’ L Series Portable Grill has a large cooking surface of 432 square inches, with stainless steel rod cooking grids that deliver a huge amount of BTUs. The primary cooking surface delivers 32,000 BTUs, the backburner offers 10,000 BTUs and the side burner offers 12,000 BTUs. The variety of surfaces aims to help you to find new heights of variety and creativity in your grilling. The L Series is also unique for its electronic push button ignition that removes the need for batteries, and the halogen lights that help you to cook with precision even after sundown.